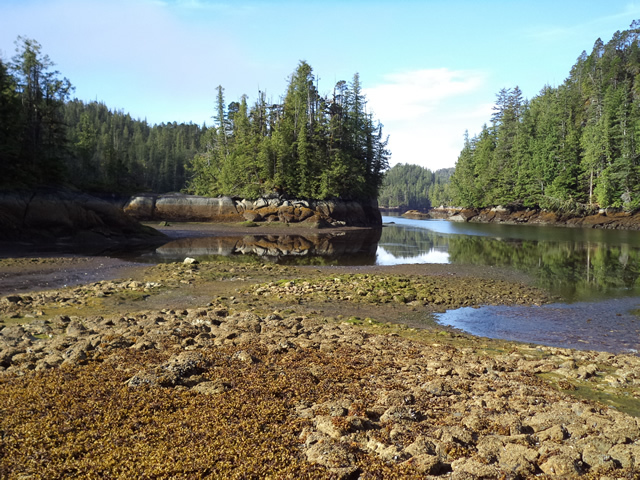 Located along the southwest end of Pitt Island, Monckton Nii Luutiksm Conservancy provides safe boat anchorages and protects a diversity of fish and wildlife habitats including marine intertidal areas, several small lakes, streams, estuaries, wetlands, forests and salmon spawning habitats. A number of small bays and inlets are contained within this conservancy, including all of Monckton Inlet, Port Stephens, Buchan Inlet, Leavitt Lagoon, Cridge Lagoon and Stephen Nelson Lake. The area also contains several culturally significant sites to local First Nations, including old village sites, traditional use areas, and several archaeological sites. Access to this conservancy is usually made by boat. Monckton Nii Luutiksm Conservancy is only accessible by boat, floatplane or helicopter and is located about 30 km SW of Hartley Bay and 105 km SW of Kitimat. It is located along the southwest end of Pitt Island, along the east side of Principe Channel. Reference: Marine Charts #3721 (Plans Pitt Island); #3741 (Otter Passage to Bonilla Island); #3742 (Otter Passage to McKay Reach); #3945 (Approaches to Douglas Channel). Reference: 1:50,000 scale Topographic Maps #103 H/4 (Trutch Island) and #103 H/5 (Port Stephens). History: Monckton Nii Luutiksm Conservancy was designated as a conservancy on July 14, 2006 following recommendations from the North Coast Land and Resource Management Plan. The conservancy provides safe boat anchorages for boaters travelling along the North Coast and good opportunities for fishing and wildlife viewing. Cultural Heritage: The conservancy is in the asserted traditional territories of the Gitga’at and Gitxaala First Nations. The conservancy contains nine known archaeological sites (i.e. pre-contact shell middens and fish traps) and has historically been used for the traditional harvest of shellfish, seaweed and trapping by local First Nations. There are two Indian Reserves (IR) adjacent to or inside the conservancy. IR #13 (Clowel) is nearby but outside of the conservancy, east of Annie Point. IR #8 (Toowartz), located at the north end of Tuwartz Inlet and entrance to Cridge Lagoon, is inside but excluded from the conservancy. Use the below links for more information or to contact these First Nations. Conservation: The conservancy protects a diversity of fish and wildlife habitats including marine intertidal areas, several small lakes, streams, estuaries, wetlands, forests and salmon spawning habitats. A number of small bays and inlets are contained within this conservancy, including all of Monckton Inlet, Port Stephens, Buchan Inlet, Leavitt Lagoon, Cridge Lagoon and Stephen Nelson Lake. Backcountry areas are not suitable for dogs or other pets due to wildlife issues and the potential for problems with bears or wolves. Wilderness, backcountry or walk-in camping is allowed, but no facilities are provided. All sites are on a first-come, first-served basis. Marine access only.